If you’re interested in applying to trade at the Festival, click here. Whether you are absorbing the sights and sounds, tastes and smells or feeling the vibes and exploring your inner self, indulge your senses, it’s all available here in the markets. Have a good wander around – you’ll be amazed at what you can find. At Glastonbury, like nowhere else, you can track down objects to amaze and delight. From the beautiful wood carvings and sculptures for sale in the Craft Field, and the unique imported treasures in the original markets in Babylon to the most random goods on this planet found skirting the edges of the Other Stage and Dance Field. A weekend is only just long enough to get a taste of all that is on offer. There’s an array of food to tantalise your taste buds; from the Far East to the Wild Wild West via good, old proper English country grub. 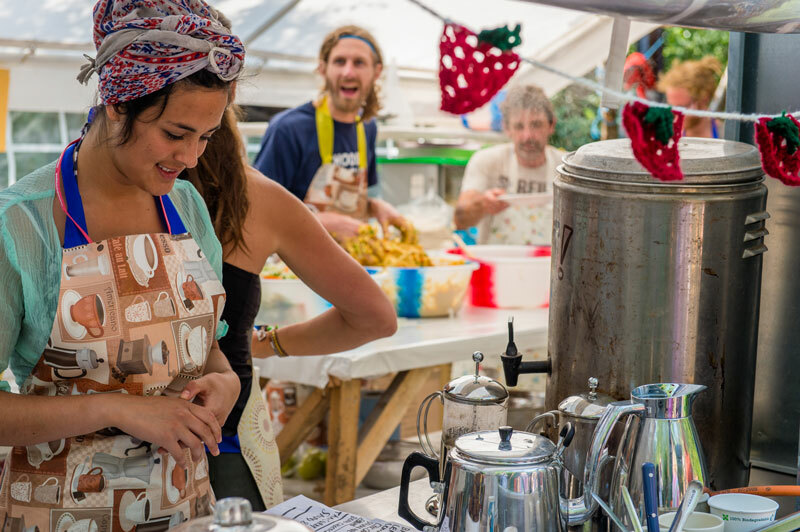 With over two hundred and fifty food stalls to chose from, Glastonbury is famous for having some of the best festival food available anywhere. And the budgets are as far ranging as the cuisine – from a purse-pleasing and soul-comforting bowl of porridge and hot mug of tea to a top-end, multi-course silver service treat.